The Sri Chinmoy Centre is an international family of seekers from all walks of life who share both a common interest in spirituality and an affinity with the teachings and activities of Sri Chinmoy. The members of each Centre provide mutual inspiration to help develop each other's unique talents and gifts; as well as finding fun, interesting and creative ways to share these gifts with the world at large. In their spare time members of the Sri Chinmoy Centre engage in a wide variety of activities including meditation, sports, music, running, art, theatre, singing, poetry and prose. For many members of the Sri Chinmoy Centre, voluntary service to their communities is an indispensable part of their lifestyle. 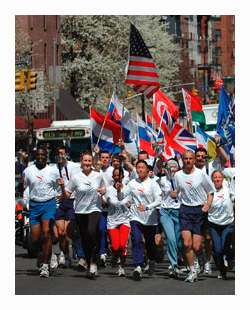 As a result, the Centre offers a number of free public programs including musical concerts, art exhibitions, free meditation classes, humanitarian aid to developing countries through The Oneness-Heart-Tears and Smiles worldwide humanitarian service, and the annual The Sri Chinmoy Oneness-Home Peace Run (aka World Harmony Run) which reaches thousands of New Zealand school children nationwide. Sri Chinmoy believes that the personal quest for perfection and self-discovery is ultimately the most important foundation for the blossoming of each individual's full potential. It is this grassroots approach to positive change which can eventually lead to the perfection of society and the advent of a truly harmonious world community. Encouraged by Sri Chinmoy's promotion of healthy living and self transcendence, his students have established many vegetarian restaurants and cafés around the world. In addition, the Sri Chinmoy Marathon Team offers an abundant variety of sport and running events designed to improve fitness levels. These events range from two mile races to marathons, ultramarathons and a flagship 3100 mile race. Multi-discipline races are also offered. 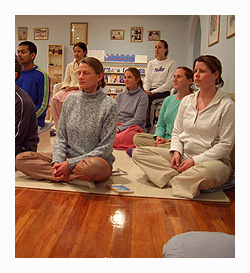 The New Zealand Sri Chinmoy Centre has been offering free meditation classes throughout New Zealand since 1983. These include ongoing introductory courses and follow-on continuation programmes in Auckland, Hamilton, Wellington and Christchurch throughout the year. In addition to our free meditation corses is a range of complementary activities including weekend workshops, concerts of meditative music, yoga and conscious cooking workshops, and occasional weekend retreats. All of our meditation courses are entirely free throughout at the personal request of our meditation teacher, Sri Chinmoy. Each of our introductory course options normally feature between 4-6 sessions and cover a carefully structured and progressive series of guided meditations. Our focus here is on teaching the essential steps to establishing a successful home practise. Options include an 'early bird' one week intensive offering five consecutive 7:00 am – 8:15 am morning workshops; a 5:45 – 7:00 pm early evening course series; and our more popular 7:30 – 9:00 pm evening programme. Our course content is drawn from Sri Chinmoy's best-selling publication, Meditation: Man-Perfection in God-Satisfaction, a comprehensive, excellent guidebook that leads the reader from the very first beginning steps to advanced levels of practise. Written with the simplicity and clarity that are hallmarks of Sri Chinmoy's teachings and writings, Meditation: Man-Perfection in God-Satisfaction is also available online and from many bookstores, from The Blue Bird's gift shop in Auckland and The Lotus-Heart in Christchurch. For more information, please visit our Meditation in New Zealand page. Brochures regarding our current and upcoming classes, running events and public concerts are available from our cafés or you contact us through the New Zealand Sri Chinmoy Centre Contact Form. Meditation Auckland – free meditation classes in Auckland, New Zealand. Meditation Wellington – free meditation classes in Wellington, New Zealand. Meditation Christchurch – free meditation classes in Christchurch, New Zealand.